I am amused with the nontrivial amount of invented needs by the bicycle industry as well as the strength of its marketing departments. Each year brings new wheel/tire size standards, new drive-train groupsets and mass-produced lifestyles and attitudes. 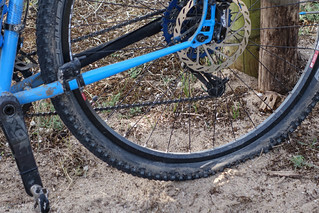 Suddenly, many enthusiasts desperately realize their need for full-suspension fat bikes with a certain kind of axles for “backpacking” “adventure” “expeditions”. I don’t see how bicycle gear obsession is any different from the common consumerism. In the photography world it’s called “GAS” - gear acquisition syndrome - which is known to be unconducive to original work. I am not immune to the disease either. In fact, I have a very heavy case of it. I’m obsessed with bikes and bike parts which doesn’t land financial wellbeing a huge favor. But the solution is actually pretty simple: just ride the goddamned bike [you already have]! When I have had photography GAS at one moment I had owned 4 digital cameras. My photographs were not amazing and most of the gear sat idle. Now I own 1 camera and 2 lenses: 35mm and 55mm. I appreciate the limitations and praise the amazing camera body every time I use it. I’m definitely not doing any worse than before. If anything, I feel a bit more creative having just 2 prime lenses. It’s the same with bikes. I recently caught another potentially expensive itch to get a new bike. And that meant one thing only: not enough saddle time! 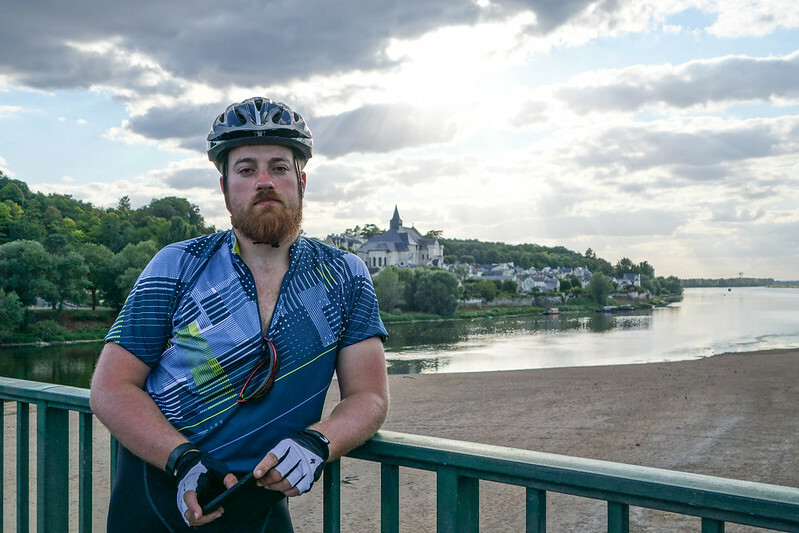 With my diagnosis unambigously established, me and John decided to go for a cure cycling tour across France. 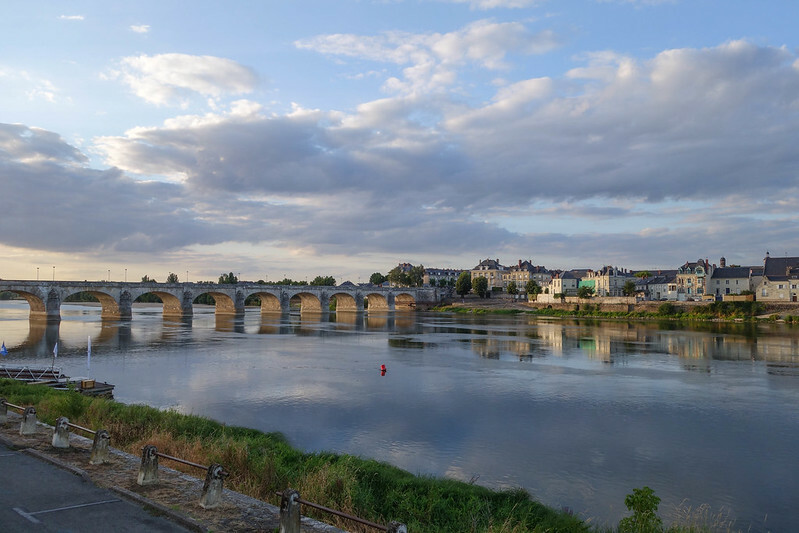 Our actual route traced through the following places: Dijon – Morvan national park – Nevers – Bourges – Saint-Aignan – Tours – Saumur – Nantes – Noirmoutier – Jard-sur-Mer – La Rochelle. The route incorporated parts of Eurovelo 6 and Eurovelo 1. We rode for 8 days and totaled approximately 1100 Km. The distances across days were spread the following way: 115 - 108 - 170 - 140 - 155 - 166 - 116 - 119. We allowed ourselves 8 days to complete it. However, we bought flexible return tickets and had 2 extra days just in case. Originally, we were thinking of a much grander 2-3 week tour this year in a northern European country. But I’m glad we decided against it because we weren’t yet ready for potential adversity. One early Sunday morning I woke-up at 3:55. I had a nice warm breakfast cooked by my dear and understanding wife. 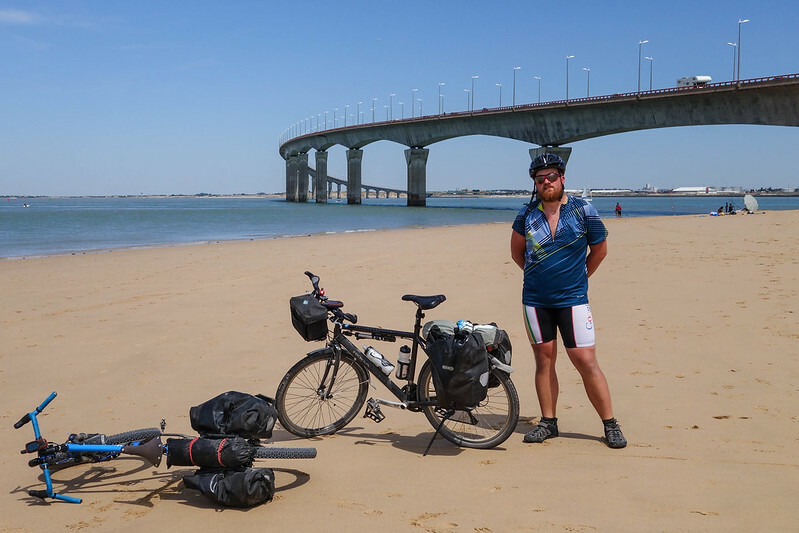 I then drove in a rented car to the train station and from there carried my packed bike and panniers across two train stations before meeting John. We then took a train to Basel where we ran with the ultra-uncomfortable heavy Tranzbags across our shoulders to the French part of the train station. I felt slightly nervous because of the french TGV train. 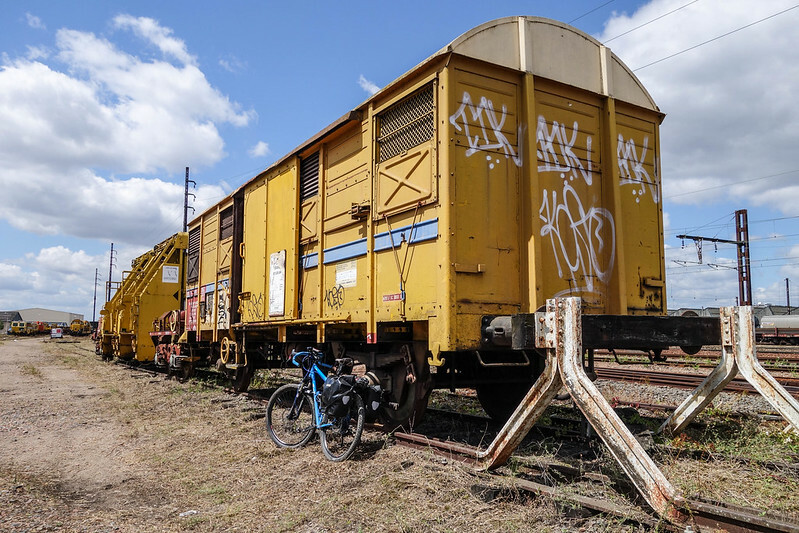 Although SNCF (the French train company) clearly states that packed bikes are allowed on all trains I knew enough of the culture to realize we might still have trouble. 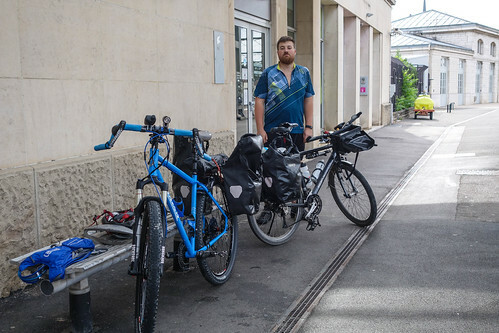 Gladly we had zero issues and soon enough we arrived in Dijon and unpacked our bikes. I suppose traveling first class has its merits. We bought some snacks at the train station and then some groceries in a Thai shop along the way. We planned our first few days to be the hardest with the most elevation gains. It’s better to plan for tough days first while you’re still rested and fresh. We learned this the hard way in the last year’s Rhine tour. Back then we rode for 30 or so kilometers the first day. And we had to ride until midnight the many days after to compensate for it. 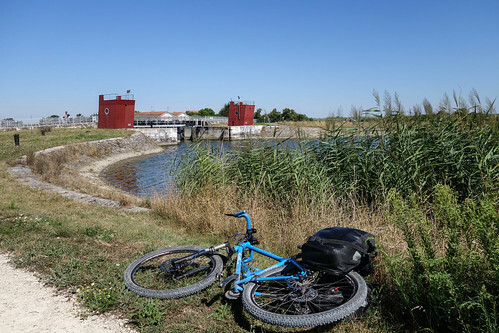 From early on we joined local insignificant roads and cycling paths. 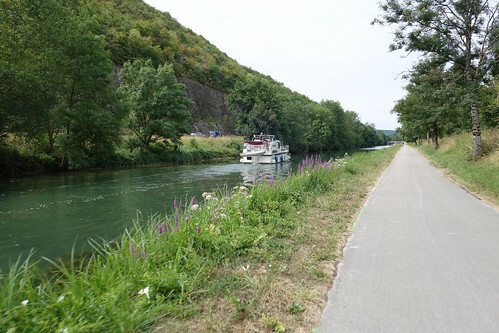 We followed beautiful Canal de Bourgogne with its many boats. 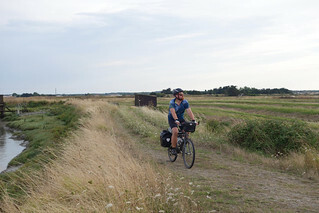 There were numerous recreational weekend cyclists on the paths close to nearby cities. 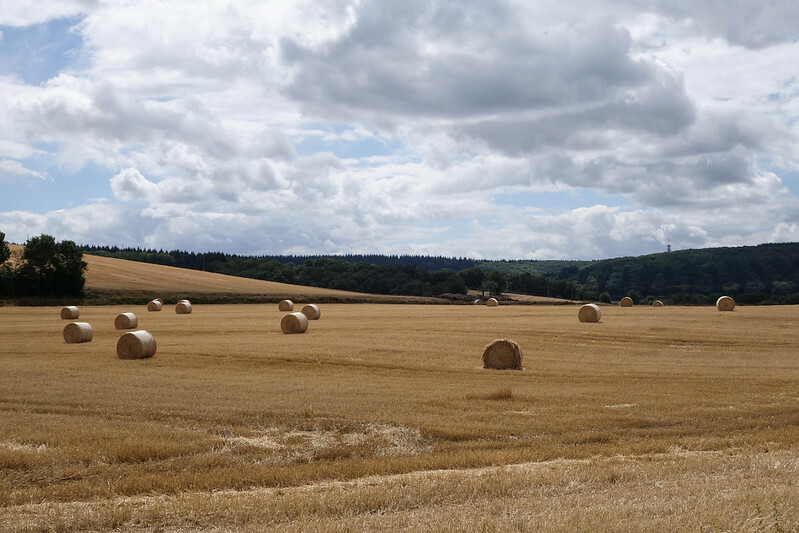 Once we departed from the canal the scenery abruptly changed into typical rural country-side France: lots and lots of fields and small run-down villages. The scenery reminded me of my home country Latvia. The weather was too perfect to be true: cloudy and around 17C. 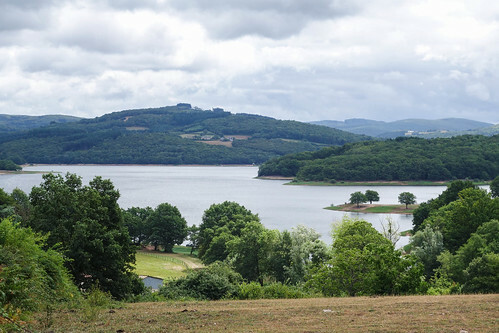 Our first destination was the Morvan national park. As we got closer our path has led us into forests and unpaved roads. Parts of the roads were washed out. Others had huge trees lying across them so we had to lift our bikes. At times we had to walk. Frankly I didn’t anticipate we would need to negotiate such terrain but these challenges set the right adventure spirit early on. Our average speed fell quickly and it was hard to imagine we would do the original 130km planned for the day. I learned that “unpaved” means different things to Swiss and French. 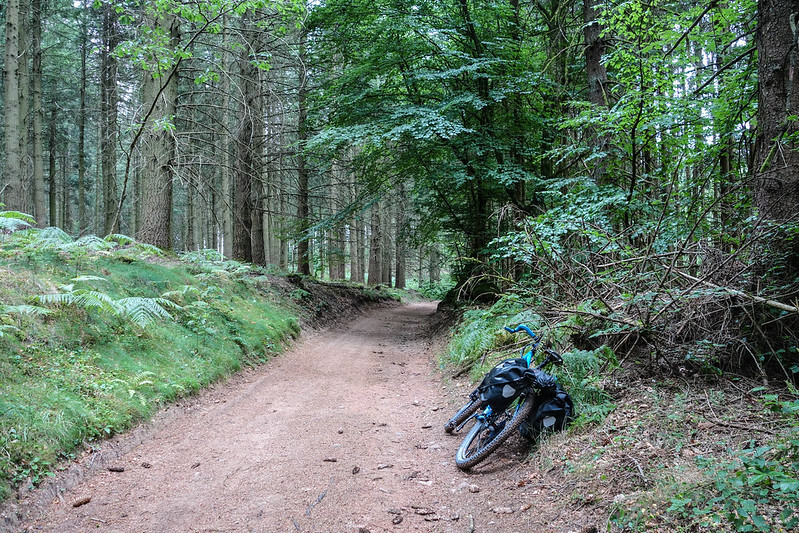 In Switzerland “unpaved” means a finely packed gravel you can ride with a road bike. 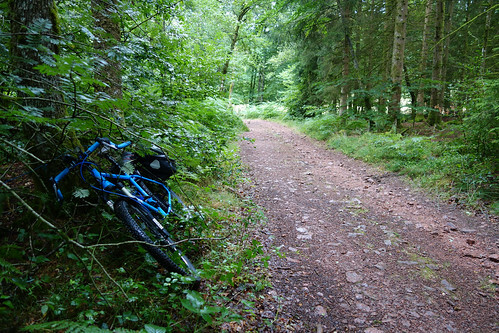 In France “unpaved” may mean a mud bath, a single-track or an alltogether abandoned path last driven on a grandfather’s Land Rover 20 years ago. I felt I should have changed my worn tires before this tour but I can only imagine how much worse it was for John who had touring tires without any knobs. 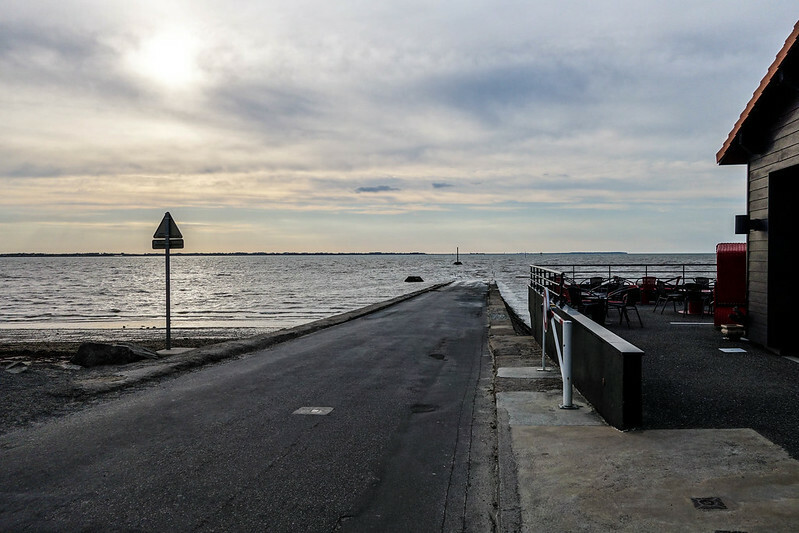 It is amazing how much the scenery changes during the day while cycling. At first the scenery appears to drag on forever. But once the day is over and you look back it’s hard to comprehend it all happened in one day. That also presents a challenge for taking photos: nothing seems interesting enough until it’s all over. And then you regret not taking enough of shots. The weather started behaving and we had to wait out a couple of showers. 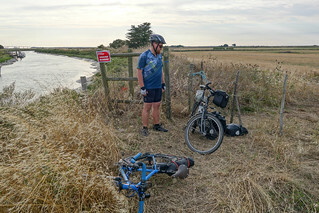 At about 18:30 we had to stop cycling because we were soaking wet and shivering from cold. Somehow my original plan of not taking rain-proof gear didn’t account for 14C temperature in summer. 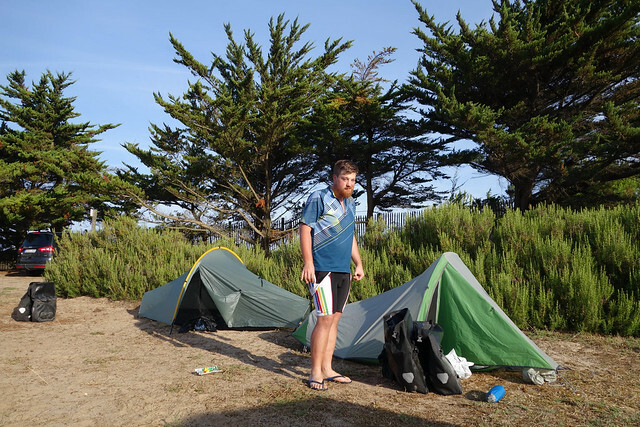 We were lucky to find a small house and not camp the first night. It would have been a miserable experience. 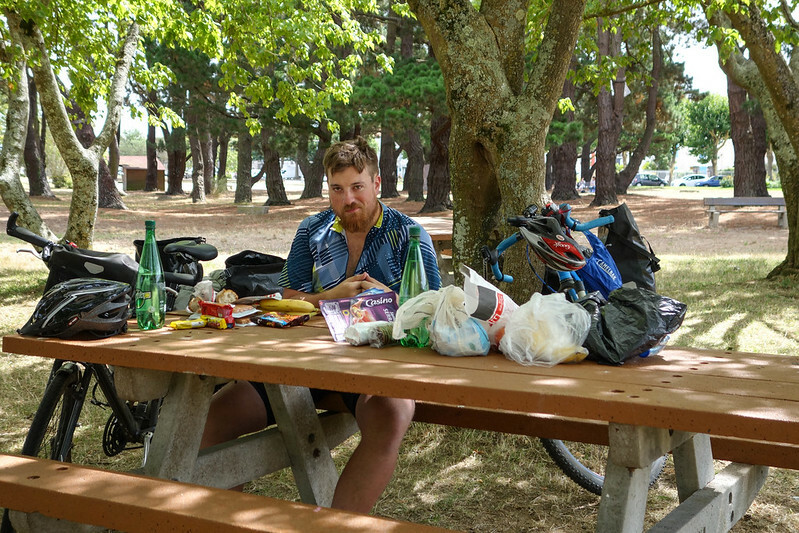 A nearby campsite had a working cafe so we downed a couple of burgers before settling down. In the morning we had to wait out a couple of determined showers despite our ambition to leave early and make the most out of the day. This tour taught me patience as ambition in the wrong circumstances is foolish. We stopped at a local grocery store to stock up on food. After a couple of days shopping for groceries became routine. 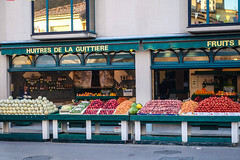 I learned that restaurants and cafes are far from necessary when it’s possible to buy varied and fresh food from the local market. I felt anger and anxiety because we were crawling and I didn’t plan for such extended terrain contingencies. I was counting on fast packed gravel speedways! 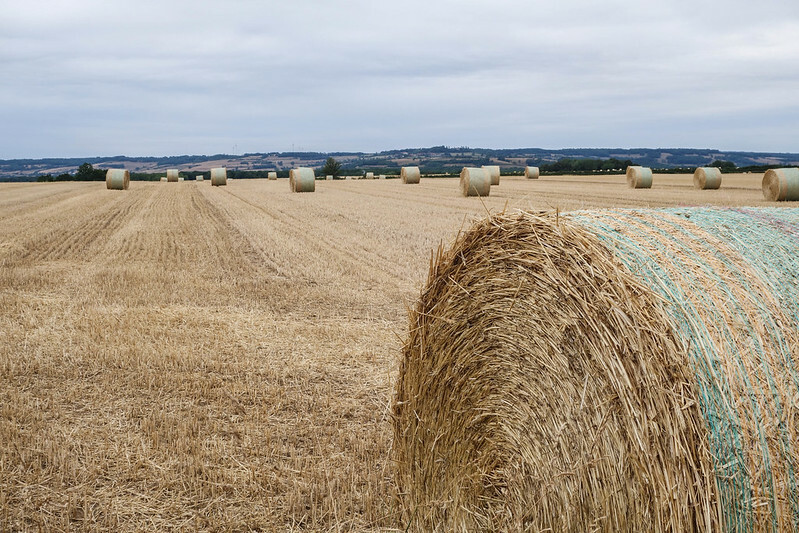 Eventually, the skies cleared and we returned to the country-side. We made a decision to divert from the original route and stick to secondary asphalt roads to get to our next target. 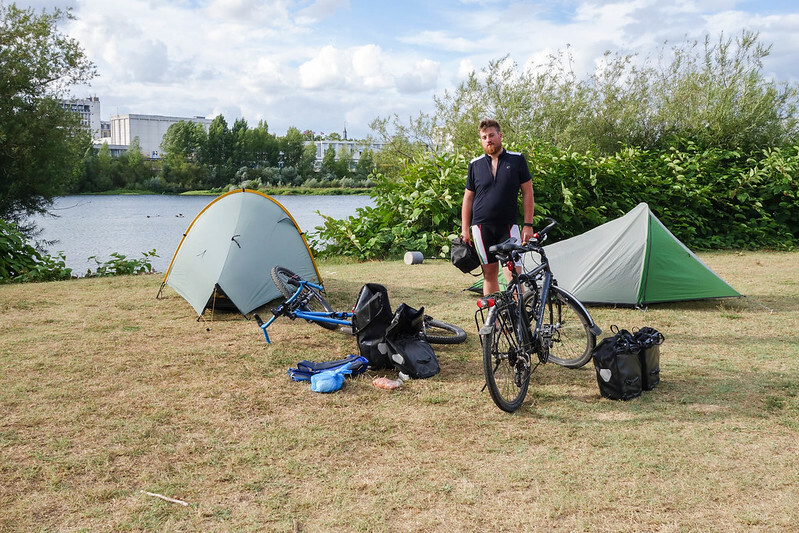 We arrived in a town Nevers and camped in the municipal camp site. We checked the weather forecast in advance to make sure it won’t rain or else camping would be a suboptimal choice. It was our first camping night and I was pleasantly surprised it took us only about 20 minutes to set everything up. Sleeping though was an entirely different story. I couldn’t fall asleep and felt cold during the night. I was restless and half awake the whole night. I forgot to take ear plugs with me. At least I’m glad we had decided to purchase summer sleeping bags. Our original plan was to use silk liners. We woke up early at 5:20 to make the most of the day as we had seen the forecast predicting rain after 18:00. Something kept me going but sleep deprivation felt miserable. This can be judged by the amount of photos taken during the day: very few. 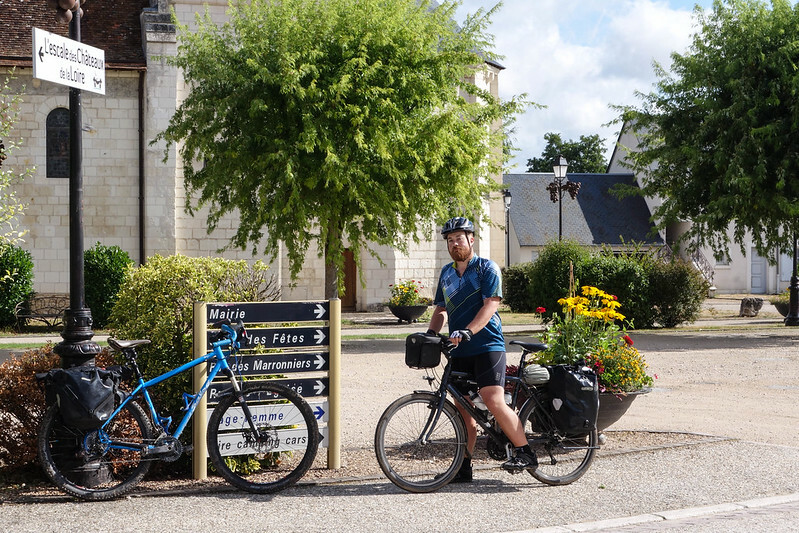 As we got to a big city Bourges by lunch time we couldn’t find a working cycling store because everyone one of the four stores was prematurely closed for a lunch break. John forgot his helmet in the train and needed to get a new one. In the next two hours we purchased groceries and went to a posh burger place. 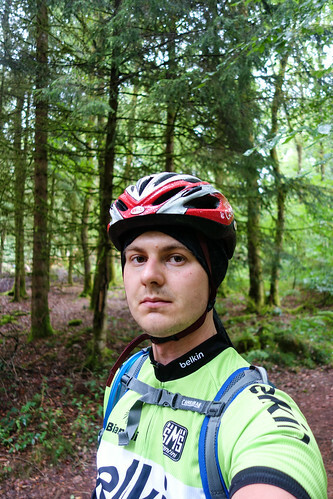 Once we bought a helmet we made a decision to continue for an extra 80 kilometers. Our progress seemed very slow. The roads were winding up and down slightly and we were going against the wind. In addition, we had taken a somewhat busy road with lots of truck traffic. At about 17:00 it predictably started to rain. My spirits were really low because I knew the forecast. 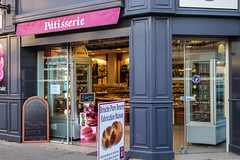 We refused to stay in Bourges because that would end the day too early. 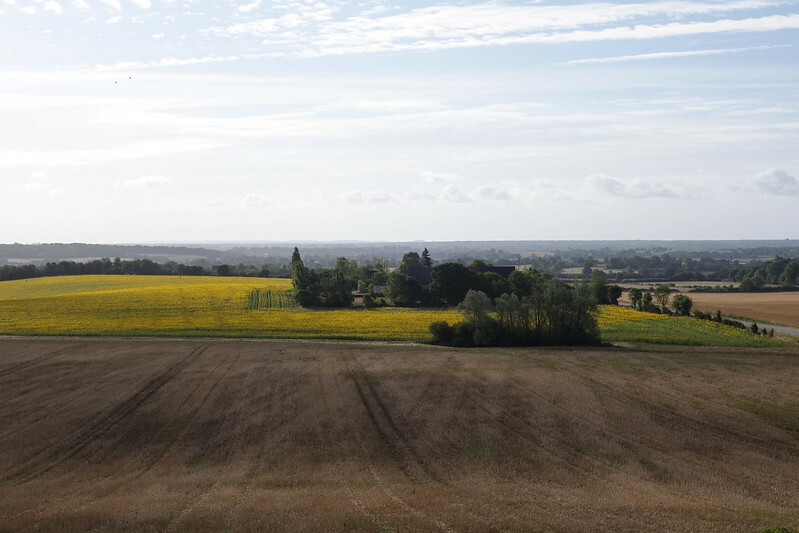 There were no places to stop between Bourges and our next target. 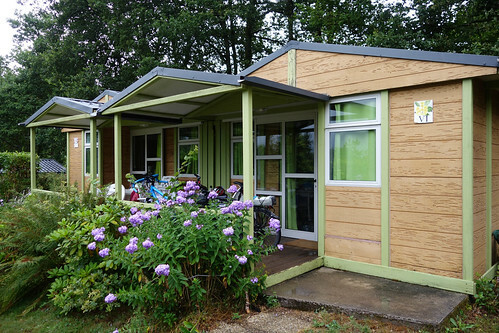 It is a persistent challenge to find accommodation at the right time. We had to continue despite the rain. The rain wouldn’t go away. So we climbed our bikes, wore the wind-proof jackets and pushed on. We soon realized it wasn’t so bad. The wind has subsided and the road radiated heat. We were wet but not cold. Our bodies eventually dried our clothes. Few hours into the ride we called a couple of hotels to book a room so that we have a place to stay when we get to the town late in the evening. At 130-140 kilometer mark we felt energized. I realized it is a very common occurrence. The first 70-100 or so kilometers are the hardest. The first 70 are, in fact, torturous because progress appears too slow. Admittedly, up to this point I felt similar to how we felt in our previous Rhine tour. Anxious and nervous we’re not making enough progress among unexpected difficulties. The tables turned the next day when I felt, for the first time, confidence and freedom from the shackles of our original plan. Our goal is to enjoy the journey and we can alter and change the route in any way we like. 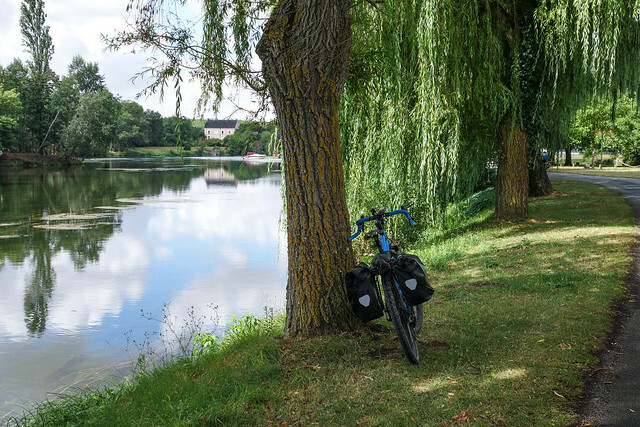 On the following days we got on to route EuroVelo 6 and from there traced the longest French river La Loire. To take the shortest path we used Google Maps directions and a micro SD slot on my phone to create a GPX track that can be swallowed by Garmin. 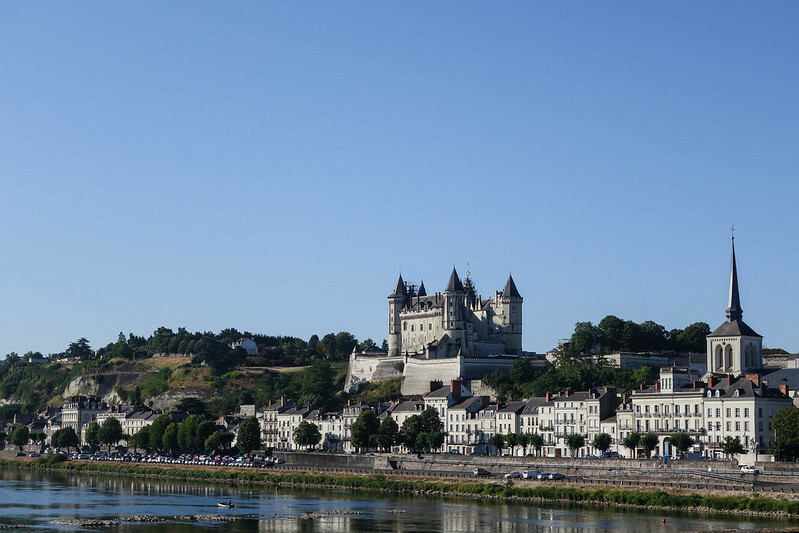 The scenery offered views on splendid bridges over La Loire and its many castles. 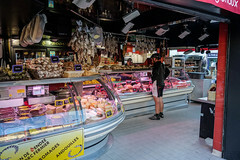 The larger French cities, such as Bourges or Nantes appeared surprisingly industrial. We got into a habit of arriving somewhat late to the campsites. Most of the receptions close at 18:00. We basically had to trespass, find empty pitch spots and then pay in the morning upon departure. This made the staff quite confused. But finishing our days at 18:00 or so seemed too early. As we didn’t cook dinner there wasn’t much to do. Why stay bored in the campsite when we can be enjoying the road? 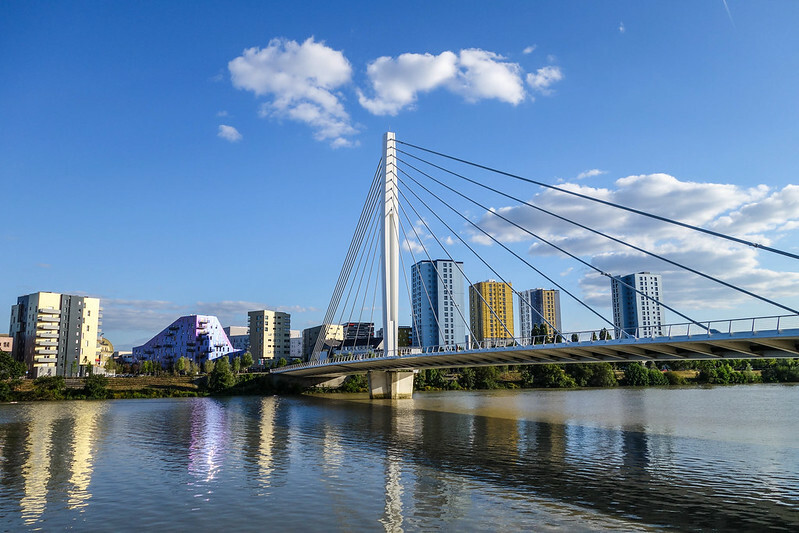 We caught up with the planned schedule in Nantes. 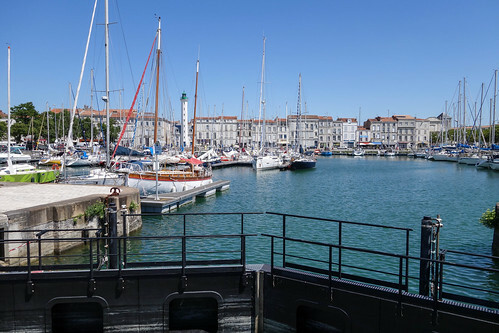 But once we have got there we decided to take a train to La Rochelle to make the last few days easier. I am so glad that the morning train was full and we decided against it! 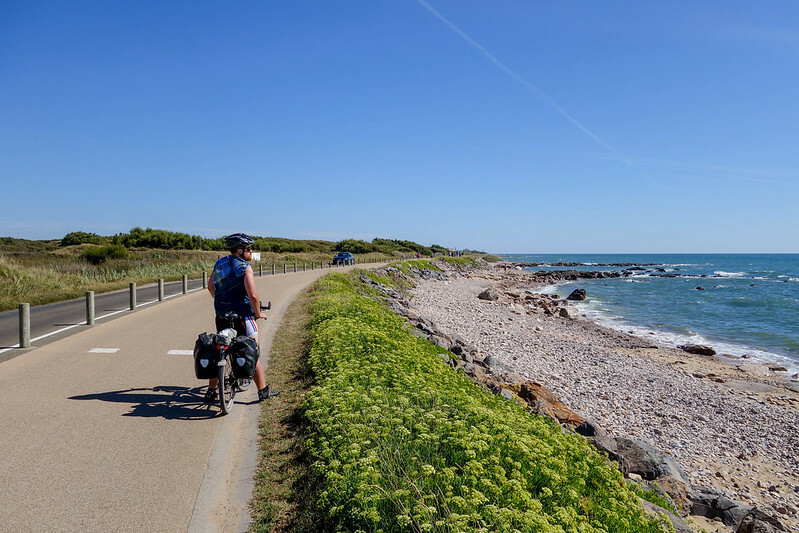 Instead, we continued EuroVelo 6 route to the coast of the Atlantic ocean and then continued South through EuroVelo 1. 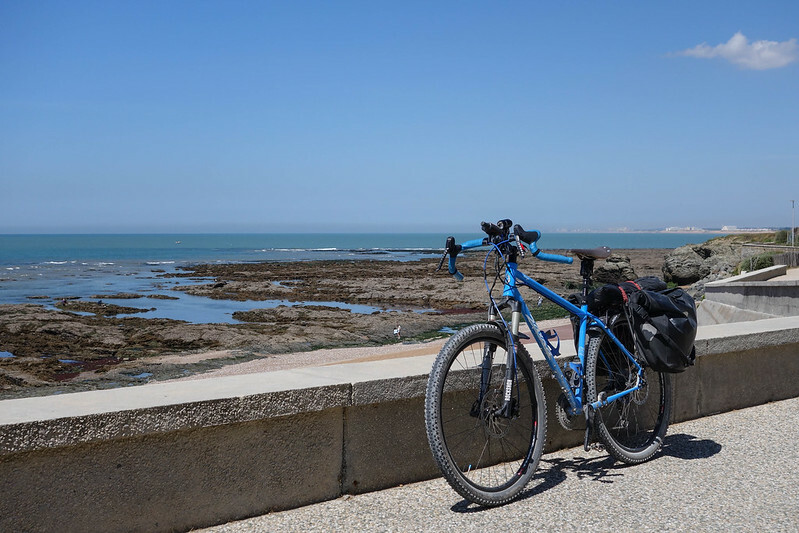 The road along the ocean has quickly overshadowed everything we cycled so far. 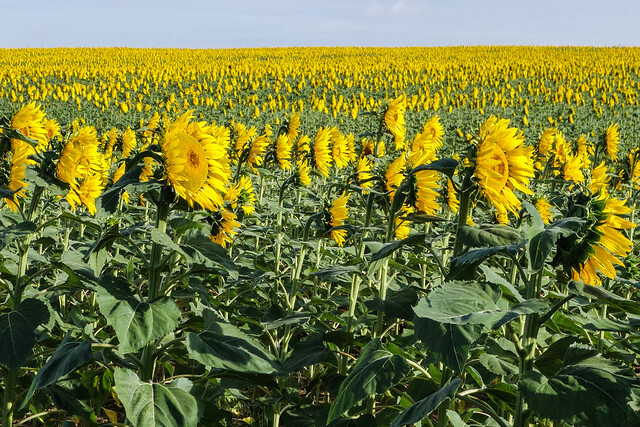 To make the last few days easier we decided to take a train from La Rochelle to Bordeaux thinking that we’ve seen enough of French country side roads. 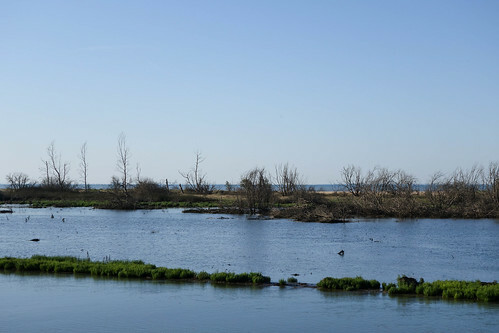 Pine trees, the smell of open water and white sand reminded me of my home country once more: it was like a bigger and better version of Jurmala. Our first day along the coast stretched late into the evening because we have run into a few problems. Namely, the road to an island we hoped to take was flooded that time of the day, we have ridden into a dead end trying to take another road and we lost each other. 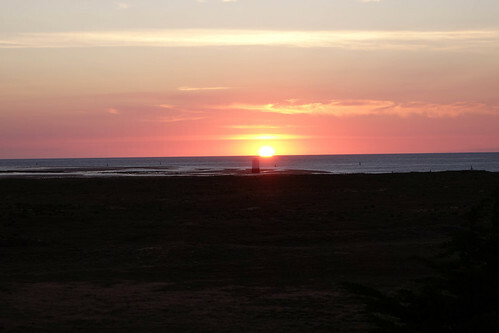 The reward was one of the most beautiful sunsets I have ever seen. 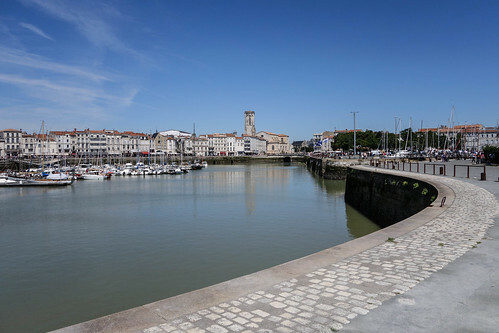 We continued along the coast until we reached La Rochelle. There were a few resort towns along the way which made me panic. I don’t like crowded places. We breezed through them quickly. 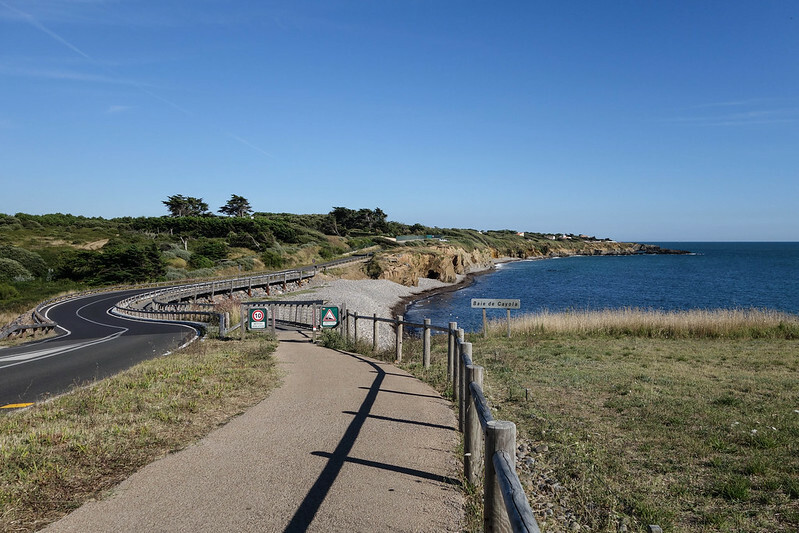 On the weekend cycling paths were crawling with beachgoers. Cycling in the early hours of the day was much better. There are also annoying obstacles, such as gates, to slow the cyclists down. 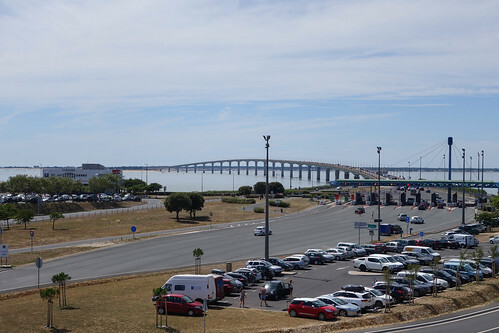 Once we arrived in La Rochelle we cycled across an enormous bridge to the Isle of Rhé and bathed in the ocean. The full photo album is available on Flickr. Links to the individual day tracks in strava: 8, 7, 6, 5, 4, 3, 2, 1.